At 1:20 pm on Friday, February 7, 1964, The Beatles landed in America for the very first time, and music history would never be the same. It would be a busy weekend for The Beatles leading up to their historic debut on “The Ed Sullivan Show” on Sunday night as they took New York City by storm. Question: Will you sing for us? John Lennon: No, we need money first. Question: Do you ever get a haircut at all? George Harrison: I had one yesterday. Question: Why does your music excite people so much? John Lennon: If we knew, we’d form another group and be managers. The Beatles were then whisked away to The Plaza Hotel (Fifth Avenue at Central Park South) in Manhattan. When the Beatles first arrived at the hotel on February 7, 1964, at least 50 policemen were needed around the hotel to try and keep the hordes of fans in line. The Beatles were taken to the Presidential Suites on the 12th floor (rooms 1209 through 1216). 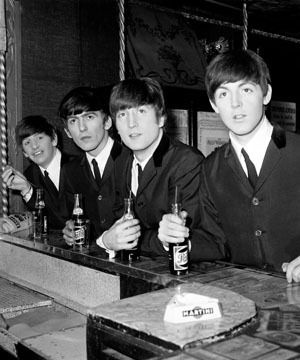 With the chaotic scene and mass pandemonium created by the fans in front of the hotel, The Plaza management was shocked to learn that the reservations made for these “English businessmen” were actually the Beatles. Inside the Plaza Hotel, The Beatles watched news reports about themselves on television and conducted phone interviews with local radio DJs including Murray the K. This was documented in the exceptional film by The Maysles Brothers, The Beatles First US Visit. The next day, Feb 8, George Harrison had strep throat and stayed in bed. His sister, Louise, came to the hotel to take care of him. While George was sick in bed, John, Paul and Ringo entertained reporters for a photo shoot in Central Park followed by many fans. They took a horse and buggy ride, posed on rocks by a lake, and had lunch at the boathouse. The threetles also went for a rehearsal at the Ed Sullivan show studio (1697 Broadway), now home to CBS’ “The Late Show with Stephen Colbert.” Since George was sick, road manager Neil Aspinall stood in for him, as can be seen in many photographs. That night, John, Paul and Ringo went to the 21 Club restaurant (21 W. 52nd Street) for a dinner party hosted by Capitol Records. After dinner, they were given a car tour of Manhattan to see NYC landmarks including the U.N. building, the Empire State Building, Broadway and Times Square, according to author Bruce Spizer. The day of the Beatles television performance there were thousands of teenage fans waiting up and down Broadway trying to get a glimpse of the Beatles entering and leaving the studio. Even though there were 50,000 requests for tickets to the show, there were only 728 seats available inside. Watching the Beatles’ performance that night in the studio audience were John’s wife, Cynthia Lennon and George’s sister, Louise Harrison. A record 73 million people watched that night. The Beatles’ sang five songs in two separate segments including “All My Loving”, “Till There Was You”, “She Loves You”, “I Saw Her Standing There” and “I Want To Hold Your Hand”. 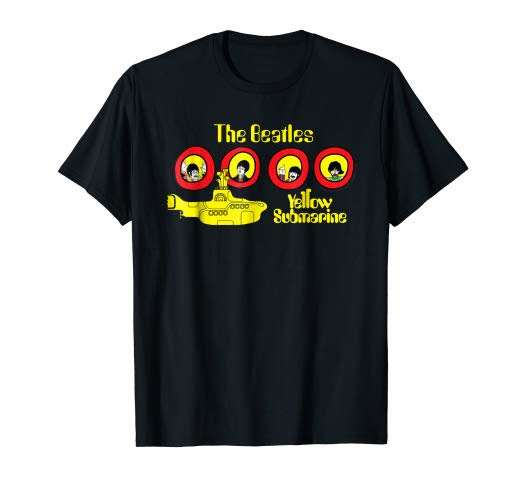 The Beatles made such an impact with their historic live appearance that it launched Beatlemania in the U.S. which still endures to this day. Earlier that day on February 9, The Beatles taped another performance for “The Ed Sullivan Show” which was shown on Sunday, February 23 after the Beatles had returned to England. On Sunday, Feb. 16, The Beatles appeared on the show again live from Miami, Florida. 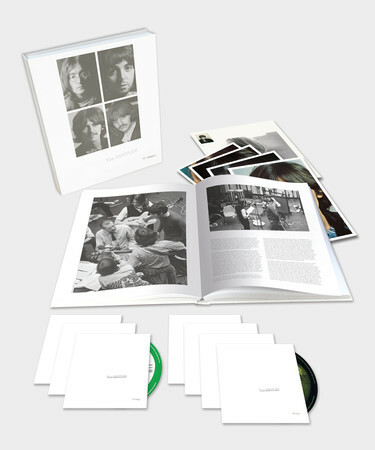 All of The Beatles appearances on the show are included on the DVD set, The 4 Complete Ed Sullivan Shows starring The Beatles. Next, The Beatles went to the Peppermint Lounge. Just like a scene from A Hard Day’s Night, Ringo Starr danced the night away as John and Paul grooved from their seats. On February 10, 1964, Capitol Records president Alan Livingston presented the Beatles with gold records for “Meet the Beatles” and “I Want to Hold your hand” at the Plaza Hotel. Several press conferences were held inside the Terrace and Baroque rooms of the hotel that day for the media. One member of the press who interviewed The Beatles that day was celebrity psychologist, Dr. Joyce Brothers. 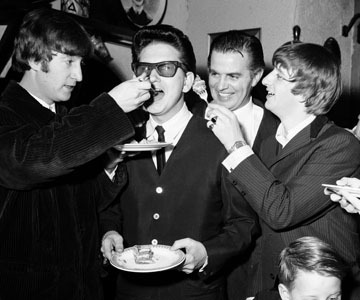 After a full afternoon of interviews, the Beatles hosted a cocktail party for members of the press at the Plaza. In just a brief four-day visit, The Beatles had conquered America. They were due to stay in America for another 10 days to perform their first U.S. concerts and appear for a second time on “The Ed Sullivan Show” live from Miami. What did Elvis Presley think when The Beatles invaded the US? Categories: Beatles History, Beatles Travel: USA | Tags: 1964, beatlemania, beatles, central park, ed sullivan show, february 1964, first US visit, jfk airport, new york, the beatles | Permalink. On December 11 and 12, VIP’s International Art Galleries in Amsterdam and Rotterdam, The Netherlands, is launching the world premiere of a new photo exhibit on The Fab Four called ‘Beatlemania.’ This unique exhibition is drawn from the photo archive of British newspaper, The Daily Mirror. These photographs follow The Beatles rise to worldwide fame and capture some of the greatest moments in their career, both backstage and onstage, as well as more personal moments. The exhibition contains 100 photographs from one of the major British newspapers who was there during the heights of Beatlemania and actually coined the phrase. According to a press release, after Amsterdam and Rotterdam, BEATLEMANIA will be seen in galleries around the world including, London, Paris, Berlin, Copenhagen, Beijing, Tokyo, Sao Paulo, New York, San Francisco and Los Angeles. The exhibitions run through January 30, 2011. 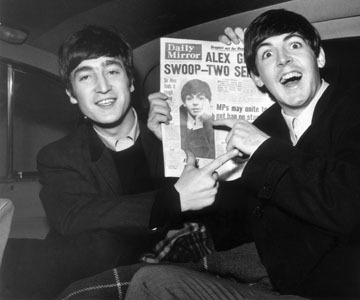 Categories: Beatles News | Tags: beatlemania, beatles, daily mirror, netherlands, photography exhibit | Permalink.